Being a teenager is super tough! Every day our young people are berated with challenges that are hard for most adults to fathom. Simply put, it’s hard to be a teenager. Most parents do their utmost to encourage doing the right thing and to speak up when someones been wronged.We no longer live in a society where wrongs that are imposed on another or verbalized are as visible as they once were. Picking on peers was once somewhat contained to hallways and playgrounds. But the worldwide web has turned the wheres and hows upside down. Cyberbullying is here and is going nowhere anytime soon. Cyberbullying can be emotionally paralyzing for the victim. It can also escalate on individual and group levels much quicker than any backyard taunting could ever do. In order to have a fighting chance against cyber bullying there is a need to be educated on its prevalence and platform. In turn, we need to inform and educate our young people. Fact: kids are killing themselves over the words peers are scribing via text, twitter and beyond. Words sting, but string those words together with fifteen other kids taunting and jeering in a group text and it makes for a cyber hell. Chat with your kids and reiterate if they are being bullied that it isn’t ok. Let them know that they are not alone. Discuss that words on a screen threatening or belittling is a form of bullying. Many kids are desensitized to violence and bullying. You tube, Snap Chat stories and other forms of social media create a strange form of peer pressure for many bullies. It isn’t sufficient to merely taunt via text, but it’s video recording someone being slandered and plastering it to their peers. It’s ganging up on a girl in the bathroom and posting on Instagram Live for all to see. It’s humiliating, lacking humanity and illegal. Whether this is relayed to the victim or the bully, these actions are unacceptable and must be stopped. 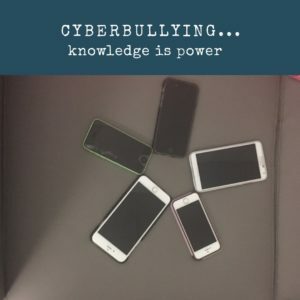 What do I do if my kid is a victim of cyberbullying….. If your child, niece, grandchild is experiencing cyberbullying reinforce that you love them and that you are there for them. They are not alone and your words can assure them that they don’t have to be. If you believe there is a direct threat to their safety contact your local authorities. So often those typing words are cowards preying on those they have no intention of causing physical harm, but rattling them emotionally. When there is no phone to hide behind the dynamics shift. It is here where the bully is confronted by law enforcement it conveys a severity of the situation. Contact their school counselor and inform them of what is taking place. It takes a village to raise a child. When the school knows it provides a further form of support that is critical. When this information is withheld from school officials it makes taking action impossible. Every child has the right to feel safe, loved and encouraged. But there are young people dreading going to school to face snickering. Young hearts are dodging their hobbies out of fear of being mocked. Define what a bully and what a victim is. Let them know you are there for them. You can do this. Next week, I am going to delve into the pertinence in encouraging our kids to speak up when someone is being cyberbullied. Voices are needed and there are too few voices out there. Please feel free to kick me any concerns or questions that you may have on this topic. Thank you for listening and know together we can make good things happen. Keep on keeping on! Pingback: The New Keys to Our Kingdom - TeamJeffers.